Serena Williams looks to capture her first W&S Open crown. Ana Ivanovic continues on in the hope of claiming her first title in Cincinnati. Roger Federer meets David Ferrer for the 16th time in his career. 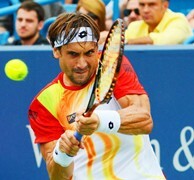 No.6 seed David Ferrer advances to his first final in Cincinnati to face Federer. The Western & Southern Open will crown a first-time women’s champion today, with No.1 seed Serena Williams taking on No.9 seed Ana Ivanovic for the title. Both women faced tough semifinal match-ups in former World No.1s on Saturday, with Ivanovic dismantling Maria Sharapova, and Serena ousting Caroline Wozniacki. The two meet for the fourth time this year and 7th time in their careers, with Serena leading their head-to-head 6-1. Ivanovic defeated the World No.1 in three sets at the Australian Open this year, but has lost to her twice since then. Ivanovic, who leads the WTA in match wins this season with 47, is 4-5 against Top 10 opponents this year. Serena, who comes off a run to the semifinals in Montreal last week, is 5-2 versus players in the Top 10. The Serbian is through to her first final in Cincinnati and is looking to claim her fourth title of the year. Serena is also hunting for her first W&S Open title. The tournament is only one of two that the American has competed in six times without taking home the crown. The men’s final features a familiar face, five-time champion Roger Federer. The No.2 seed will take on No.6 seed, and first time Cincinnati finalist, David Ferrer in the hopes of claiming a record sixth title here. Ferrer’s Saturday semifinal proved an easy match for him, as he ended Frenchman Julien Benneteau’s Cincinnati run with a 6-3, 6-2 defeat, while Federer recorded his sixth consecutive win over big serving Canadian Milos Raonic 6-2, 6-3. Today’s match marks Federer’s 121st career final, while Ferrer is competing in his 45th. The two men meet for the 16th time in their careers, with the Spaniard never recording a win against the Swiss man. In men’s doubles on Saturday, the World No.1 duo of Bob and Mike Bryan defeated fellow countrymen Sam Querrey and Steve Johnson 6-3, 6-7(5), 10-8. The twins will face American Jack Sock and Canadian Vasek Pospisil in a rematch of the 2014 Wimbledon final. Sock and Pospisil, champions at Wimbledon and the BB&T Atlanta Open, continued their undefeated 14-0 debut by ousting 2014 French Open champions Julien Benneteau and Edouard Roger-Vasselin. 7-6(5), 3-6, 10-6. Today’s women’s doubles final will feature No.6 seed Timea Babos and Kristina Mladenovic versus the No.7 seed Americans Raquel Kops-Jones and Abigail Spears.